On Wednesday I got an update from the transition home. Rachel, an America World employee, moved to Ethiopia in January to work from the transition home. I was so excited to read what she had to write about our kids. Our daughter is battling a persistent, nasty ear infection. It's a bizarre feeling to read about the children we've prayed for, but don't know. To read ABOUT them and read that one of them is under the weather. If she were here, we'd probably be able to help her recover quickly under the watchful eye of a good pediatrician. So I read the emails from Rachel regarding our daughter's health and feel quite helpless. I'm going to make a few calls today to get an opinion from my dear uncle (family bias dictates that we all hold him to be the BEST physician in the world). Back to the update...according to Rachel our daughter is quite a sweet girl and loves to get attention from Rachel. Our son is always smiling and happy. Do they say this about all the babies? I wonder...if your child was a grump, would they tell you? Her kind words about our kids is a balm to my soul. Also, was the picture of the older children that she sent. In our referral picture our daughter looks much older than the 4 years that she is said to be. In the picture with other kids, she looks so small! Rachel said she will write updates every other Friday for the waiting parents. So, next Friday I can expect another. Until then, I'm going to be CLOSELY watching the families who are travelling to pick up their kids this week. You can follow along and perhaps, catch a glimpse of our two adorable kids! Here are the links for families with blogs (though there are two others traveling also): the Harpold's, the Treadwell's, the Wegner's and the McIlrath's. Our official documents came bright and early. Here's a shot of me (care of budding photographer, Everett) holding the AWAA referral package. We signed the acceptance and wrote out a large check to the agency to cover the last of the program fees. The mess I'm standing in the middle of? The contents of our office. Seth painted the office walls, but ran out of paint before he could finish. Chaos is lovely, isn't it? We also mailed the care package to Mel, a mom who is picking her daughter up next week. We sent a photo album for both kids, a blanket for our babe, stuffed animal and bag for our big girl (what girl doesn't like a pink purse?) and a couple little clothing items. Seth's attempt at putting together our crib...looks great until you notice that the side rail is not attached and just leaning against the crib. He ended the entire charade with a flourish by tossing his jacket on the floor and growling, "It's so HOT in here!" We keep our house at a balmy 67 degrees. I laughed out loud then called him Chris Farley. 1. Right now we are expecting a FedEx (you know how I love those guys) package from AWAA. This will include a hard copy of everything Duni emailed us. Also included are acceptance forms that we will sign and send back (along with a large sum of money). 2. Girmachew, our rep in Ethiopia, will submit our paperwork to the Ethiopian courts requesting a court date. 3. Several weeks from now (hopefully) we have a successful day in court. Seth and I are NOT in Ethiopia for this. We have given power-of-attorney to Girmachew to represent us in court. On this day our kids become officially OURS. This is the day that I can plaster their cutie faces all over this blog. Betcha can't wait! 4. Girmachew requests an appointment at the American Embassy for us to get our kids visas. This determines the day we travel. This will usually fall 3-4 weeks after court. 5. We go to Ethiopia, pick up our kids, do the Embassy thing and come home. We will probably be in Ethiopia for about a week. I'm making this seem far more simple than it is. Things can go wrong, things do go wrong, paperwork is tricky sometimes. So, we need your prayers that all pieces of the paperwork fall into the right hands in a timely manner. Yesterday it happened--we got the call from Duni! All of the information for our daughter is complete so Duni sent us her information in an email. I spend Thursdays out all day with my kids. I guess it's on the road-schooling since we leave the house after breakfast and don't get home until a bit before dinner. Imagine our surprise when Duni's message played! We had stopped on our way home at the store to pick out a few things to send to our kids. Mel graciously agreed to bring a few things to the transition home when she travels to pick up her daughter next week. We are so thrilled with this! My mind is still reeling, because we didn't expect to hear from Duni so soon. Our daughter is beautiful. In one photo she has a gorgeous smile, and in the second she looks like a total grump. Ella is thrilled with these pictures, as she was concerned earlier this week when we only had a picture of her brother. When she prayed last night, she said, "God, thank you, I got to see a picture of my sister on the computer." Oddly enough, my ticker yesterday said 9 months of waiting. We got our referral exactly 9 months after our dossier was accepted. Isn't that funny? Along the same strange lines...I have a prayer journal. That sounds a little more formal that it is. It's just a composition pad that I started writing in 2 years ago. I spend time with God daily, but I don't write in it everyday. I think I even let 6 months pass without writing in it once. Though sometimes, it's nice to pour your heart out on paper. Then praise God when he brings peace in a hardship. It has been a blessing to read through it to see what we struggled with and how God has answered our prayers over time. He is so faithful! So, this morning, I was writing about our referral and a thought about dates hit me. I was wondering how long we have actually been in the 'process of adoption'. So I turned back, almost to the beginning. There, was the date Feb 22, 2006. 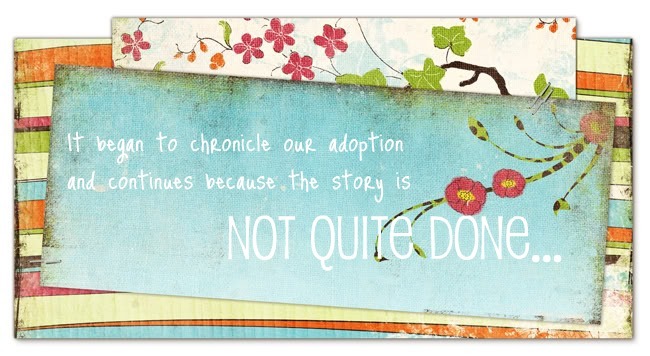 And I read, "Last night I told Seth about my prayers for adopting again and he agreed that we should adopt." I don't know why we waited 9 months, I never would have expected it. I don't understand all of the history of my new kids. BUT I do know that the date of our willingness to trust God and the date of our referral--that isn't a coincidence! God is in the details. He puts His mark on our lives, showing us that He is listening and He does care. Did He slow things down so that we wouldn't get our referral until now, just so these dates would match? Nah, I don't think so. I think He's got more important reasons for the timing of this. But would He tweak the day that Duni calls, just to reveal himself to us? Certainly. I posted about our geography night, but left the topic of Ethiopian cuisine for another post. This is that post! For those of you who would never, in a million years, want to eat Ethiopian food, much less cook it, then come back another day. My family first ate Ethiopian food two years ago. We loved it. Not only Seth and I, but the three kids too. They loved eating injera and using their fingers. Since then, they are always excited when we get a chance to eat Ethiopian food (not too often, the closest restaurant is 45 minutes away). I would love to cook Ethiopian at home, but I'm a pretty timid cook. I spent the first few years of marriage trying to find my way around the kitchen. I became an avid cookbook collector, hoping that I would soak up skills by reading about great chefs. Now I have a massive culinary library, still lacking the talent that would be very beneficial. Oh, but there is something about reading a good recipe, knowing that I couldn't replicate it! So, it's with this mindset that I decided to conquer Ethiopian food. First, I knew we needed injera (Ethiopian flat bread). In reading extensively about making it (here's a great series of posts on the process), I decided that I would NOT be making it. First of all, teff flour is hard to find. Secondly, I can only imagine the havoc if I spent 13 days (not a typo, I mean 13 DAYS!) preparing a perfect yeasty, teffy dough only to cook it wrong. The first time it sticks to the pan--whammo! I'd have to throw it against the wall. Not good. So for sanity's sake I just figured we need to buy injera. Unfortunately, no one around here sells it, we would have to make a visit to one of the restaurants that are closed on Mondays. I stumbled onto this post though--this gal, she thinks like me! Working on a recipe for 13 days? No thanks--here's the easy method for making injera. It lacks the sour taste that you would get in the traditional method, but does the duty for scooping food up with your meal. As for the rest of the meal... I saw this recipe for Atar Aleche on the Ethiopian Adoption blog. This is similar to the split pea soup I make, but spicier and yummier. It was very easy to make, I pureed the onions for simplicity. I also used butter instead of niter kibbeh. My kids DEVOURED this, it wasn't too spicy. Soak the split peas for an hour in three cups of water. Bring the peas to a boil. Reduce heat and simmer 30-45 minutes, adding more water if necessary. When the peas are cooked, drain any excess water and mash well. Set aside.In a dry pan over medium heat, stir-fry the onion and garlic for 2 minutes, stirring frequently. Turn heat down a little. Add the niter kibbeh or butter and sauté until the onion becomes transparent. Add the mashed peas, turmeric, salt and green chili to the onion mixture. Add the water and cook to reduce the mixture to a thick, well-spiced puree. Serve warm or room temperature with injera. The split pea recipe didn't make very much. Fearing I wouldn't have enough food for our geography night guests (because isn't this everyone's worst nightmare? ), I found this recipe on the same blog. I originally had hoped to make a Shiro, but don't have any shiro powder. The Waal's had brought home a tupperware full of berbere, and shared some with me. This recipe was also EASY (or as Eli would say, "Easy as a piece of pie."). A little bit spicy, but my kids still ate it. Though I think it set fire to a few timid souls at the geography night. 2 lb hamburger, browned with 5 garlic cloves. In dry pan over moderate heat, stir fry the onions for 4-5 minutes, stirring constantly. Add the oil and berbere and cook for about 1 minute longer. Add the potatoes, water, hamburger and tomato paste and stir well. Cook, covered, over medium heat for about 30 mins, or until the potatoes are tender. Stir frequently. Turn heat down and add a bit more oil if it starts to stick. There should be a moderate amount of sauce. Serve warm with injera or rice. This was such a success for my family I will definitely be making this meal again. 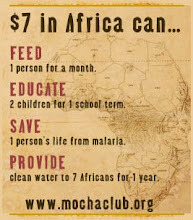 AND I might even get my courage up enough to stop reading about the marvelous Ethiopian meals and prepare a few others! a serious case of bed head. Unless you are Everett (or Robert Smith). When he saw his hair today, he said, "This is what you call a good hair day." He's completely serious. He tries to make his hair look like this...on purpose! So he's loving that today he did nothing, just woke up and "voila!" hair already mangled crafted to perfection. What's a mom to do? And, yes, he is wearing a fur vest. I won't even go there. My family has an acronym we use often. TITF (read Tih-t-ffff). I'd give you a chance to guess what it stands for, but I doubt you'd get it. So, here it is: taking it too far. We created the acronym one night when my sister took a joke "too far." My mom takes on projects with such gusto that we began using it frequently in reference to her...exuberance? Her planning gone nuts extreme passion has surfaced in myself and my three sisters. When she pulls out the spreadsheet detailing the meals we will enjoy while visiting her house, we glance at each other and whisper, "TITF". We get a good laugh when mom's doing it. Sadly, it rears it's ugly head every once in a while in our lives--while planning a brunch, going on vacation, or...doing school projects. My kids and I decided to take part in a geography night. When I asked them if they would like to just go and visit or be in charge of a table; they all voted to do our own table. This could possibly be the first indication that the "TITF" curse has already passed on. As the story continues you will find that I am too far gone to ever help my kids recover and lead normal lives. Anyway...back to geography night. I coerce them into deciding that Ethiopia would be the best choice for a country. We visit the library, read books, look online at info and draw a diagram of how we want our big board to turn out. At night, while the kids are asleep, Seth catches me cutting out photos and matting them on cardstock. His accusing tone stings, but I reply, "Oh, honey, you really don't want the kids using a papercutter. Come on, this is a matter of safety!" The kids were so pleased when the display board gets finished almost overnight. We press on and soon the big day arrives. There are a few loose ends to tie up. Everett is most concerned with what outfit he will be wearing (definite indicator of TITF, why MUST we have costumes?). Ella has borrowed a traditional Ethiopian dress from friends, so Seth digs around in the attic and pulls out a soccer jersey. This pacifies Everett, and he couples it with a corduroy suitcoat (since that is what an Ethiopian boy wore in one of our books) and jeans with holes in the knees. Later that night he will wonder why no one seems to 'get his costume' but for now he's pleased. Eli wears a running shirt because he wants to be like the famous runner, Haile GebreSelassie. I'm just wondering how I'm going to pull together Ethiopian cuisine. Our plan was to visit one of three Ethiopian restaurants for lunch. All about 1 hour away and they are all closed on Mondays. So that plan didn't work out. Do I admit defeat? No way--if we only provide a display board, children's books, Ethiopian coffee service set, Ethiopian money, traditional clothes, but no food? Well, we wouldn't be TITF, thus letting down our family curse. So, I hit the internet and attempt to cook my first Ethiopian meal ever. That is a post in itself, so I'll leave you with pictures of our successful trip around the world. In keeping with traditions in bloggy world, this is my 100th post so I should be posting a list of 100 things, probably about me. That is intimidating. So I will put it off. Is that cheating? This is just an update on a slightly horrid day. The horrid part was really just the MRI experience with Ella. Several things went wrong for us. I won't go into major detail (shocker there). To sum it up: the IV had to be put in before the anesthetic, the anesthetic was unexpectedly administered rectally, and 2% of children don't respond to the anesthetic. Our daughter happens to reside in that rare 2%. Imagine that. She fought everything, even the sleep inducing drugs. After a second dose, she still didn't pass out. The only good thing: we got some very sweet time together as I rocked her for an hour. She was very sleepy and I realized that I probably haven't sat down and just ROCKED her in a few years! We used to rock every night before bed (very good bonding experience). After several hours in the hospital, we left knowing we will have to return in the near future. At which time they will administer GAS to my poor little girl. She left in high spirits though. Seth promised her pancakes at Cousin Ron's pancake house. That brings a smile to even the most shaken soul. I was so tense when we sat down I looked at Seth and said, "I think I need to cry." Then ordered a belgian waffle with whipped cream and strawberries. Ella followed my wonderful example. Nothing like drowning a bad experience in fluff and sugar. The past two weeks have been busy with our agency. Our in country representative has been running around trying to get court scheduled for five families that have been waiting since mid-October. In all of his rush to do that, he's still managed to get paperwork done for 5 referrals. Wednesday, two families (go see pictures of one baby) had successful court appointments and today the five families who have been waiting finally have court. We've been praying that all five families would have a successful ruling and travel arrangements are made soon. They will hear this afternoon about court. You can check two of their blogs if you'd like: Steigers, and Treadwells as they will be able to post pictures of their kids after they are legally theirs. We are....still.....waiting....and I am getting a tired of it. Can I say that? It just hit me hard today. It's been nearly 9 months, so I'm trying to remember that this is how long the wait is when you are pregnant. Certainly we can wait 9 months for our kids. BUT, we have been *in process* since 2006. Almost two years ago we decided to adopt again! So, really, we are birthing an elephant. I'm ready to POP. It doesn't help that all other areas of my life seem in a state of flux. Seth drives an hour to the Big City everyday for work. He makes the most of his time, but it's still an hour to work. Then an hour home. Then if it snows, well...you get the picture. We don't really want to move up there, but off and on we talk about it. Yesterday, he sent me a link detailing 2 years of road work that will probably add another hour to his commute. That would make his commute beyond ridiculous. So we made a list. We both love lists. Somehow you can feel like you accomplished something when you make a list. Even though nothing has really been done. This list has been made many times before. It's the "What we need to finish so we can sell our house" list. And it's long...and depressing. And we never do anything on it. Today, Ella has an MRI scheduled at noon. Just to see what's happening in her noggin. The great mystery won't be solved by an MRI, but perhaps we can feel better knowing we now have pictures of her brain. I teased her that we may find out she's missing part of her brain. Eli is quite intrigued with the idea of taking pictures inside Ella's head. Last night, in a very concerned tone, he asked me if they would stick a camera up her nose. Though I explained in detail how it would all happen, I guess he zoned out at my first words, "Ella has to go to the hospital so they can take some pictures of her brain." I can only imagine what's he's been cooking up for the past week. Ella seems clueless, though she was concerned about not getting any breakfast this morning. I'm also concerned. How do you hold off feeding a kid who's first words every morning are, "We eatin' cereal, Mommy?" I spent a lot of time praying about that, because eating breakfast is a big deal to this little girl. I also prayed a lot about how things are going to go down at the hospital. When Ella had her past surgeries, she was two. They gave her a stuffed dog and she went off with the anesthesiologist. The second time she got a tea set (huh?). Now she's older and wiser. She pitches a fit when she has to leave the waiting area to have her weight taken. Don't even think about getting her blood pressure, as that will throw her into a fit of hysteria. So I covet your prayers this afternoon. That she won't be scared and that the MRI will come back with good results. My Flesh and Bone (click for the trailer)-Seth and I got this documentary from Netflix and it took us about 3 weeks before we finally watched it. We knew it would be hard to watch, and it was. It documents a year in the life of a family of 14, many of the children are special needs, all being cared for by their single mom. It was very moving. Here's Susan Tom's website. The Connected Child-This book was recommended by a dear friend who has a daughter that was adopted as an older child. We share stories about the antics of our daughters, oddly, their behaviors are quite similiar. She found this book and called me immediately telling me it is a must read. It's hard, as an adoptive parent, to find a book that helps you parent your child. I don't generally think about Ella as my "adopted kid" but when I'm assessing her behavior, I always think about her past in regards to her reactions. This book has been brilliant in helping to understand why she may be doing some of the things she does. It mentions seizures specifically (last night I read that alcohol in utero can cause seizures in children). Though we'd love to just forget where our kids spent their first years (when in a bad situation), those are the years that most affect how they deal with the present. It takes A LOT to overcome all of the struggles and this book is the first that I've read that moves beyond the--get ready for this, you don't know what you are getting into--stage. It's more of--we are going to equip you to help your kids overcome their first years. I haven't finished the book, but wanted to pass it along while I was thinking about it. Jane Kurtz I just read about this author on our agency's yahoo forum. I hadn't heard of her, but once I saw her books; I realized that the kids and I have read several of them. We are planning on doing a geography night with a local homeschool group next Monday. I've been trying to get some fictional picture books on Ethiopia (because we are, duh, the Ethiopian table at this shindig) so that Ella and Eli can get a feel for Ethiopia. We've been devouring Ethiopian history books, non-fiction picture books, internet sites on Ethiopia--but a lot of it is over their heads. Eli's favorite thing so far is Haile G, famous Ethiopian runner. Ella's most interesting pick is the bath of the Queen of Sheba (pictured in a book we went through). Obviously we need to delve in a bit more. Jane Kurtz is the lady I've been looking for! She was raised in Ethiopia, when she came to the US as an adult she missed the country so she started writing about it. She's part of a very cool program, Ethiopia reads. Even if you aren't interested in Kurtz, go check out the Ethiopia reads site--it may push you to do something for a kiddo in Ethiopia! This article from Parade magazine-My sweet Grandma clipped this out and sent it to me. Which was so kind, because I stopped getting the local paper (it served no purpose other than to fill the recycling bin). I had heard about the article, but hadn't taken the time to search it out. If you haven't read it, go take a peek. It's a very eloquent piece written by Melissa Faye Greene about a trip to Ethiopia with her daughter. It will touch you. This morning I really thought that today we would get the call. We had been anticipating a snow storm for days. It finally hit early this morning. Seth got a call at 5 am (as he was walking out the door) telling him that he had the day off. As he was stripping his coat off, telling me the good news, my first thought was, "Today would be a great day to get the call." Alas, it didn't come. But we enjoyed a snow day anyway. Eli recovering from daddy's snowball. Everett trying to avoid daddy's snowball. Daddy relentlessly pummelling his children with snowballs. And enjoying it. Though it may seem like our referral consumes me, it really doesn't. My heart jumps a few times during the day-especially when the phone rings. Otherwise, I'm so busy with living my life that waiting for our referral doesn't cripple me. I think about our kids that aren't with us. A lot. I don't think about them in a sad, wonder-if-they-are-hungry, sort of way. I can't do anything but pray. So, I pray that God provides for their needs and that their paperwork will fall into the right hands. I pray that their first family has peace in whatever situation they are in. I pray that the kids who are here in our house right now don't have a hard time when we bring our other kiddos home. Then, I think about what it will be like when they finally get here. I relish a few moments of bliss. Because I know (remember, I've been there before) that bringing a child into your home isn't always happy moments. There are trials and terse times, but for now I can totally just spend this time dreaming about holding two more kids. Squeezing two more little bodies onto the sofa at night as we read. Pulling more chairs up to the table for meals. Watching two more little fish at the pool. Blowing two more sets of kisses as I whisper, "Goodnight, I love you."